Preheat the oven to 450°F. Put the empty cast-iron skillet on the middle rack of the oven to preheat and get really hot. Keep it in there until oven reaches temperature and you are ready with the following batter. Stir together the sugar and zest in a small bowl and set aside (this is for the top later). Beat eggs with an electric mixer at high speed until pale and frothy (about 4 minutes). Beat in milk, vanilla, cinnamon, nutmeg and salt. Gradually add in the flour and continue to beat until smooth, about one to two minutes more. Batter will be thin. Take the hot skillet out of the oven carefully and add the butter. Swirl around until it melts and coats the entire bottom of the pan. Immediately pour the batter in and return the skillet to the oven. Bake until puffed and golden-brown, about 18 to 25 minutes. Serve immediately! Top with a squirt of lemon and the lemon sugar mixture (if desired). 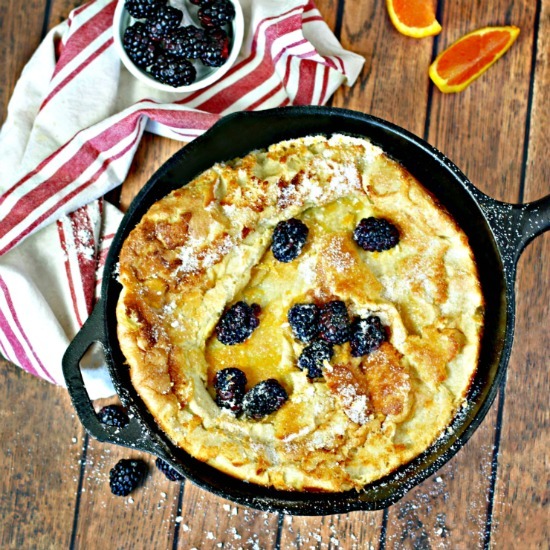 Add berries and finally dust with confectioner’s sugar. Ok, don't judge, but you can also drizzle maple syrup over it. Enjoy! 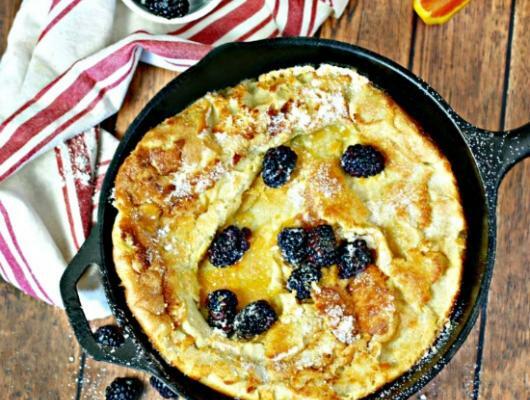 Skillet Puffy Pancake is a one bowl, less than 30 minute, pantry items, extraordinary breakfast that will impress and delight your guests!